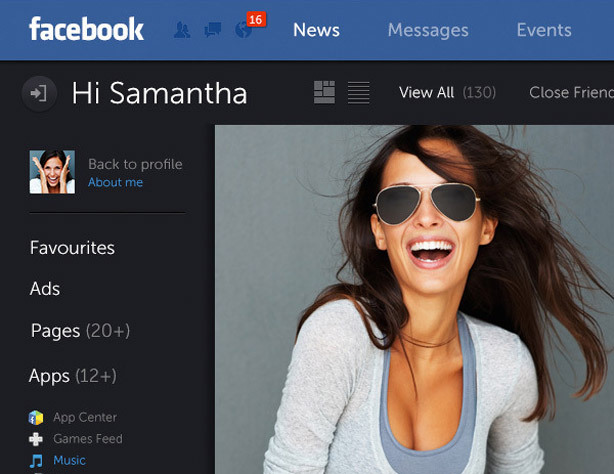 I came across this unofficial Facebook redesign concept which focuses on improving User Interface (UI) and User Experience (UX) of the social media giant. 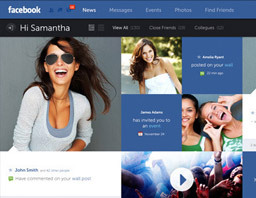 The concepts introduced look really nice and the use of images makes it more fun and vibrant to be on. However for redesign concept I find it a little too much. There is a lot of blues used throughout and dark colours too, for example the menu navigation at the side on the dashboard page. Don’t get me wrong, I like what Designer Fred Nerby has come up with in terms of the UI elements but it would look better on a lighter coloured design concept. There was also a comment by the blogger who shared this that the current Facebook design is slow at times, with this concept I would think that it would be longer for it to load than what they have now. Especially with soft shadow effects and the heavier use of images. The look is also quite Windows 8 and some of it reminds me of the MySpace redesign, maybe it’s the use of images and block layouts that is used. There has been a lot of bad criticism from my part so far so I think it would be good to talk about the parts I like now. The clean layout and style used is one of the features I like as a UI concept and the use of colour to define the various sections is lovely and beautiful like on the Profile pages and the timeline section for it. 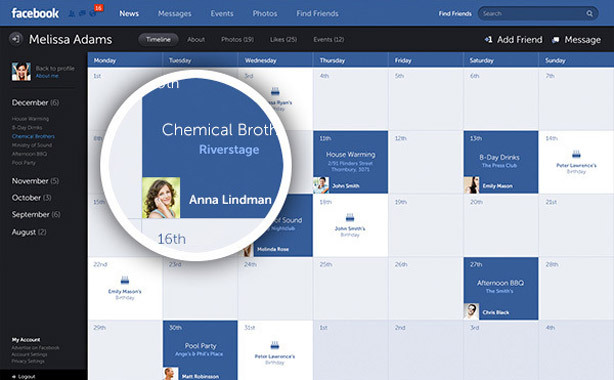 The events page is very nice, the calendar interface is just like the ones you see on email applications and on Macs, so some familiarity is good and would be intuitive. In terms of UX it is harder to tell with this just being a flat image concept so the way elements appear and the animations that introduce them can’t be judged in the way it affects the user. 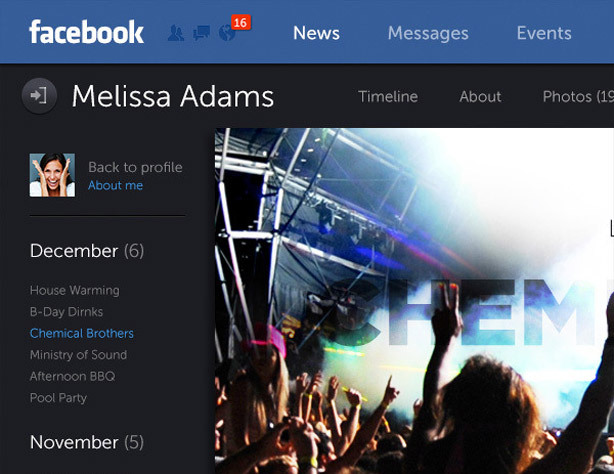 But like I said before the way things are broken down is simple enough like on the Profile and brand profile pages. However I do find the interface too dark at times which would make the experience of using it a bit gloomy. I wouldn’t enjoy it too much after using it a while. The way the UI is now with the current Facebook is nice and bright which I find appealing to look at and keeps me on their longer. To conclude the ideas introduced by Fred Nerby are very nice from a UI and UX perspective but not necessarily for this Facebook redesign concept. There is a lot blue that is used, this could be made more subtle. Perhaps even making backgrounds lighter in colour, like white or soft blue. With the changes I think the menu on the dashboard can work really well and some of the image galleries make the site more fun and vibrant to look at.